Inspired by the dressed-down elegance of the California lifestyle, we created a shoe that takes you from the indoors to outdoors with ease. 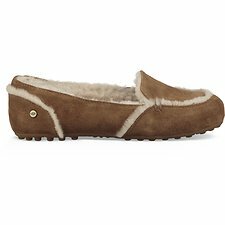 The Hailey blends our soft slippers with a loafer silhouette and features shorter-length sheepskin for any weather. Pair with bleached denim bellbottoms and a silky top.